Petzl ADJAMA Climbing Harness. 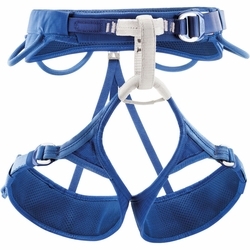 The adjustable leg loops of the ADJAMA harness make it an ideal piece of equipment for mountaineering and ice climbing. With its ENDOFRAME Technology construction, it provides excellent weight distribution around the waist and legs to ensure greater comfort. The DoubleBack Light buckles on the waistbelt and leg loops ensure quick and easy adjustment. The tie-in points are made of high-tenacity polyethylene for improved resistance to rope friction.